Ramos, Renato, Edgar Rodrigues and Alexandre Samis. Against all tyranny! 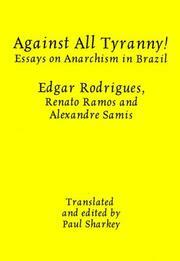 Essays on anarchism in Brazil . Kate Sharpley Library: 2003. 33 pages. Translated by Paul Sharkey. A history of the Brazilian Anarchist Movement, with biographies of some of the comrades who made it was it was. 9781873605189 Not currently available. Find at a local library.